Background: Polymorphisms in the apolipoprotein E (apoE) gene may modulate lipoprotein metabolism and influence plasma lipid levels. Thus, polymorphisms in the apoE gene have been associated with an increased relative risk of coronary artery disease (CAD). Objective: To determine whether or not the apoE gene increases the risk of heart blood stasis syndrome (HBSS) in premature coronary heart disease (PCHD) pedigrees. Methods: Twenty-eight core pedigrees with PCHD and HBSS were collected. The apoEε2/ε3/ε4 genotype was measured using a PCR-RFLP technique. HHRR and TDT were used with core pedigrees based on the result that the apoE polymorphism was linked with PCHD. Results: According to HHRR, the apoE ε4 allele may be associated with PCHD with HBSS (P<0.05). According to the TDT test, the susceptibility loci of CHD with HBSS may be linked to the apoE ε4 allele (P<0.01). Conclusions: The apoE ε4 gene polymorphism in PCHD and HBSS pedigrees associated with coronary heart disease, and coronary heart disease susceptibility loci may be linked with apoE ε4 alleles, which indicates that the apoE gene may be linked to the susceptibility location of HBSS in CHD within the Hunan han nation population. In recent years there has been a trend for younger age at onset of coronary heart disease (CHD), which is termed premature coronary heart disease (PCHD) . It is known that CHD is a multifactorial disease; specifically, CHD is a polygenic disease affected by environmental and genetic factors . The occurrence and development of CHD is related to a variety of susceptibility gene polymorphisms, especially the apolipoprotein E (apoE) gene polymorphism. The theory of traditional Chinese medicine holds that the underlying pathogenesis of CHD involves blood stasis, which is the most common syndrome in patients with CHD  and PCHD. Therefore, in order to provide evidence for clinical prevention and treatment of coronary heart disease, whether or not the apoE gene polymorphism is one of the genetic and molecular biological markers in PCHD stasis pedigrees within the Hunan han nation population is worthy of further study. A clinical epidemiologic study was conducted with a focus on coronary syndromes between October 2007 and December 2013 in the Changsha region, A total of 2356 people with CHD who met the WHO diagnostic criteria  and some people who had additional genetic studies and provided informed consent were enrolled. Finally, 50 families were prepared by screening, including 40 cases of PCHD family and 10 cased of health control family. The total number of the PCHD family members were 131 cases, including male 67 cases, female 64 cases. Among them, according to the standard of syndrome differentiation and typing of group standards: there were 25 families with 81 cases of PCHD with blood stasis syndrome, age (53.01 ± 11.05) years old, male 43 cases, female 38 cases, especially the core pedigrees of 18 families with 54 cases; and there were 15 families with 50 cases of PCHD with non-blood stasis syndrome, aged (56.70 ± 9.15) years old, male 24 cases, female 26 cases, especially the core pedigrees of 10 families with 30 cases. The total number of the health control family members were 46 cases, aged (55.48 ± 10.20) years old, male 21 cases, female 25 cases. There were no significant differences in gender and age gender and age in three groups. The premature coronary blood stasis pedigree was defined as follows: proband (males<55 years of age and females<65 years of age) with PCHD and blood stasis; and a first-degree family member (parents, siblings, and offspring) with premature coronary blood stasis. PCHD was diagnosed according to patient age, clinical symptoms, signs, history, and ECG changes on the basis of the 1979 WHO ischemic heart disease, angina, and myocardial infarction diagnostic criteria. The Chinese medical syndrome differentiation standards of CHD were according to the syndrome differentiation classification standards of The People's Republic of China, pharmaceutical industry standards, and the TCM syndrome diagnosis standards. Healthy control family group of random individuals: Hunan Han healthy families randomly selected with proof of good health based onlaboratory and physical examinations. • The subjects of this detection were the family. • The family had at least 2 members who had been diagnosed with premature coronary artery disease. Subjects were not limited to gender. • Severe hypertension, diabetes, cancer, liver, kidney, and thyroid disease. • The following types of heart disease: diabetic cardiomyopathy; hyperthyroid heart disease; hypertensive heart disease; pulmonary heart disease; anemia heart disease; and rheumatic heart disease. • Hepatitis, tuberculosis, and other infectious diseases. • Patients refuse to sign the informed consent or estimation of compliance is poor. • In other clinical trials of patients. The subjects were asked to fast for 12 h before blood sampling (2 ml of venous blood) at 08:00 h as detailed in Molecular Cloning: A Laboratory Manual  for genomic DNA extraction and testing of DNA purity; DNA genotypes were identified by PCR-RELP. Primer 1 and 2 were as follows: 5'- ACA GAA TTC GCC CCG GCC TGG TAC AC-3'; and 5'- TAA GCT TGG CAC GGC TGT CCA AGG A-3', respectively. The DNA primers were synthesized by Shanghai Biological Engineering Company (Shanghai, China). The reaction parameters were as follows: 95°C denaturation for 5 min; 80°C with the addition of Taq enzyme (2 μ) for 1-5 cycles at 95°C for 1 min; 72°C for 3 min, denaturing at 95°C for 1 min; 65°C refolding for 1 min; extension at 72°C for 1 min (a total of 30 cycles); and extension at 72°C for 10 min. Digestion, polyacrylamide gel electrophoresis, and UV observations revealed two restriction sites: arg158 → cys158; and cys112 → arg112 in apoE. Six types of apoE genotypes existed: ε2 / 2; ε2 / 3; ε2 / 4; ε3 / 3; ε3 / 4; and ε4 / 4, derived from the ε2, ε3, and ε4 alleles (Figure 1). 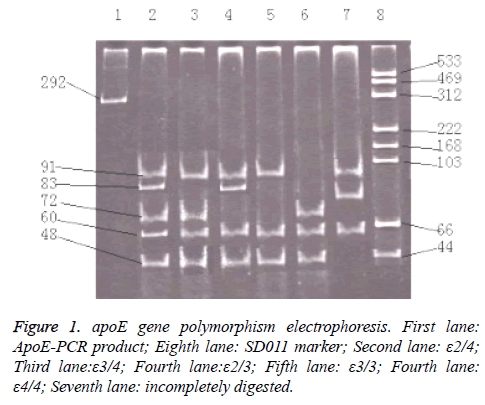 Figure 1: apoE gene polymorphism electrophoresis. First lane: ApoE-PCR product; Eighth lane: SD011 marker; Second lane: ε2/4; Third lane:ε3/4; Fourth lane:ε2/3; Fifth lane: ε3/3; Fourth lane: ε4/4; Seventh lane: incompletely digested. The details of the study were explained to the subjects and the study was approved by the Hunan University of Traditional Chinese Medicine Ethics Committee. Statistical analyses were performed with SPSS 16.0. The genotype and gene frequency distribution were compared by a χ2 test. In core pedigrees, genetic association analysis associated with alleles and disease were analyzed by haplotype relative risk and a transmission disequilibrium test, and a χ2 test was used to demonstrate differences in the rate of distribution. In three groups of subjects, the basic data were collected and compared. As shown in Table 1, the three groups in age, gender, height, weight, body mass index (BMI) had no significant difference in constitution, there was no significant difference between the groups (all P>0.05). PCHD blood stasis pedigree group, non-blood stasis pedigree on systolic blood pressure were higher than that of the control group (P<0.05~0.01). By χ2 test, PCHD blood stasis pedigree group, non-blood stasis pedigree group compared with the healthy control group, history of smoking were different (blood stasis pedigree group OR=6.02, χ2=13.98, 95%CI=2.22~16.35, P=0.000; non blood stasis pedigree group OR=2.86, χ2=6.55, 95%CI=1.25~6.53, P=0.016). Note: Compared with the healthy control group: *P<0.05; **P<0.01. Table 1. Comparison on three groups of clinical data. As shown in Table 2, three groups in blood glucose (BG), total cholesterol (TC), high density lipoprotein cholesterol (HDLC), low density lipoprotein cholesterol (LDL-C) had no significant difference in constitution. There was no significant difference between the groups (P>0.05). Triglyceride (TG) of PCHD blood stasis pedigree group was higher than that of the healthy control group (P<0.05), and had no difference with non-blood stasis pedigrees group (P>0.05). Note: Compared with the healthy control group: *P<0.05. Table 2. Comparison on three groups of blood glucose, blood lipid (͞x ± s, mmol/L). ApoE gene polymorphism analysis showed that 3 alleles were detected in 28 PCHD patients and their parents, and the differences between the apoE gene frequency distribution of patients or parents observed and predicted were not significant (P>0.05; Table 3), which were in accordance with the Hardy- Weinberg equilibrium. It was shown that the samples were from a larger and random mating equilibrium population. Table 3. Genetic goodness of fit test of apoE genotype in core pedigrees. According to the Hardy-Weinberg equilibriumcalculating each gene prediction was basically the same by the χ2 test (P>0.05). PCHD pedigree groups (including pedigree groups with stasis and non-stasis pedigree groups) in both genotype distribution and allele frequencies were not significantly different (P>0.05; Table 4). The PCHD and healthy control pedigree groups were significantly different with respect to the frequencies of the ε2 andε4 alleles (P<0.05; Table 4). Table 4. Number and frequency distribution of apoE genotype and allele in CHD core pedigrees. Based on the haplotype HHRR analysis for 28 core pedigrees, among apoE (2N) alleles of the blood stasis pedigrees, 4 (W) ε4 gene transferred, 11 (Y) did not deliver, 32 (X) transferred among 57 non-ε4 genes, and 25 (Z) did not transfer. Typing coronary blood stasis was associated with apoE ε4 gene polymorphism (P<0.05; Table 5). Table 5. apoE gene haplotype relative risk (HHRR) analysis of premature PCHD pedigree. There were 14 pedigrees with stasis meeting with TDT analysis, in which ε4 alleles from heterozygous parents to offspring passed 4 times and did not pass 16 times; non-ε4 alleles from heterozygous parents to offspring passed 16 times and did not pass 4 times. The results suggested that the susceptibility loci of PCHD with stasis may be associated with the apoE ε4 allele locus (P<0.01; Table 6). Table 6. apoE allele transmission disequilibrium (TDT) analysis of premature PCHD pedigree. According to genetic epidemiology studiesthe incidence of CHD of the first-degree relative was 2-10 times non-CHD, and the familial aggregation of CHD existed. CHD in relatives occurred sooner, and the risk of individuals with CHD was higher [6,7]. In the past, we [8-11]conducted genetic pedigree analysis on 54 patients with CHD blood stasis probands and 54 healthy people, which suggested that there is a causal relationship between children with coronary blood stasis and parental illness. Studies have shown that coronary blood stasis syndrome may be a "multi-gene evidence" with a genetic predisposition. The main physiologic functions of apoE are important components of plasma lipoproteins, LDL, some HDL subtypes, and ligand binding with receptors of LDL and apoE. There are three major isomers in human apoE (E2, E3, and E4), coded by three alleles (ε2, ε3, and ε4) of a locus. The different affinities between the three major isomers and apoE receptors affect lipid metabolism, and different apoE gene polymorphisms affected the individual lipid levels . Findings confirmed the ε4 allele was a risk factor to coronary arteriosclerosis and CHD, and the difference in the prevalence of CHD in different regions was associated with the distribution of apoE phenotype. Heidari  suggested that the ɛ3/ɛ3 and ɛ3/ɛ4 genotypes were predisposing factors in Iran. Yin  suggests an association between the apoE ε4 allele and an increased risk of CAD in a Chinese population based on the present meta-analysis. Zhu et al. observed that the ε4 allele frequency of patients with CHD<55 years of age was significantly higher than the frequency in patients>61 years of age and healthy subjects, suggesting that the apoε4 allele may be independent and be susceptible genetic risk factors of premature CHD. Ding et al. found that the heterozygous genotyping apoE ε4/3 and the frequencies of the ε4 allele in the early-onset CHD group were significantly higher than age-matched controls (P<0.05). The occurrence of early-onset CHD is affected by apoE gene polymorphisms. Zhang et al. also thought that different genotypes are associated with CHD through serum lipids. The current study showed that the association between premature coronary blood stasis and the apoE ε4 gene polymorphism based on HHRR analysis and the chain between the susceptibility locus of premature coronary blood stasis and the apoE ε4 alleles based on the TDT test were similar with the results reported above. Thus we believe that the apoE ε4 allele may be one of the susceptible genetic risk factors for premature coronary blood stasis, and we can provide new methods and new ideas for the prevention and treatment of people at highrisk for premature coronary blood stasis. This work was supported by National Natural Science Foundation of China (81373550, 81673963); Program of China Postdoctoral Science Foundation (2012M521526, 2013T60771); Program of the Fok Ying-Tong Education Foundation of China (131042); Key program of Education Department of Hunan Province of China(17A163). Qanitha A, de Mol BAJM, Burgner DP, Kabo P, Pabittei DR, Yusuf I, Uiterwaal CSPM. Pregnancy-related conditions and premature coronary heart disease in adult offspring. Heart Asia 2017; 9: 90-95. Antiochos P, Marques-Vidal P, McDaid A, Waeber G, Vollenweider P. Association between parental history and genetic risk scores for coronary heart disease prediction: The population-based CoLaus study. Atherosclerosis 2016; 244: 59-65. Li J, Yuan Z. Pathogenesis of coronary blood stasis research. Chinese J Integrative Med Cardio/Cerebrovascular Dis 2006; 4: 613-615.
WHO. Proposal for the multinational monitoring of trends and determinants in cardiovascular disease and protocol (MONICA project). Cardiovascular Disease Unit, Geneva: 1982. Sambrook J, Fritsch EF, Maniatis T, Jin D, Li Z. Translation, molecular cloning guide second edition, Science Press 1992, Beijing. Silberberg JS, W lodarczyk J, Fryer J. Risk associated with various definitions of family history of coronary heart disease. The newcastle family history study II. Am J Epidemiol 1998; 147: 1133-1139. Setia N, Verma IC, Khan B, Arora A. Premature coronary artery disease and familial hypercholesterolemia: need for early diagnosis and cascade screening in the Indian population. Cardiol Res Pract 2012. Zhi-Xi HU, Si-Yuanm HU, Lin LI, Jie LI, Zhi L, Chao H. Impact of polymorphism of angiotensin converting enzyme gene on premature coronary heart disease with blood stasis syndrome. Chinese J Integrative Med Cardio/Cerebrovascular Dis 2013; 11: 515-518. Jie L, Ling-Li C, Zhao-Kai Y, Zi-Zeng X, Zhi-Xi H. Relationship between risk factors of premature coronary heart disease and sub-health state. Chinese J Integrative Med Cardio/Cerebrovascular Dis 2013; 11: 857-858. Lin L, Zhi-Xi H, Jie L, Wei-Xiong J, Chao H, Wen Z, Wen-Xin Y. Progress of genetic researches on coronary heart disease and blood stasis syndrome. J Traditional Chinese Med University of Hunan 2013; 33: 85-88. Zhao-Kai Y, Li-Ping W, Xian-Ping H, Jie L. The screening and functional pathway analysis of differential genes correlated with coronary heart disease of blood stasis syndrome. Chinese J Integrated Traditonal Western Med 2012; 32: 1313-1318. Martínez Morillo E, Nielsen HM, Batruch I, Drabovich A, Begcevic I, Lopez MF, Minthon L, Bu G, Mattsson N, Portelius E, Hansson O, Diamandis EP. Assessment of peptide chemical modifications on the development of an accurate and precise multiplex selected reaction monitoring assay for Apolipoprotein E isoforms. J Proteome Res 2014. Heidari MM, Foruzannia SK, Khatami M, Hadadzadeh M, Emami Meybodi M. Apolipoprotein e gene polymorphism in Iranian coronary atherosclerosis patients candidate for coronary artery bypass graft. Iran J Basic Med Sci 2013; 16: 841-844. Yin YW, Sun QQ, Zhang BB, Hu AM, Liu HL, Wang Q, Hou ZZ. Association between apolipoprotein E gene polymorphism and the risk of coronary artery disease in Chinese population: evidence from a meta-analysis of 40 studies. PLoS One 2013; 8: e66924. Tie-Bing Z, Zhi-Jian Y, Gen-Shang M. A study on apolipoprotein e polymorphism in early onset of coronary heart disease. J Nanjing Med University (English Edition) 2003; 17: 82-86. Fu-Xiang D, Hua-Xin L, Tong-Ku L. Analysis of relationship between apolipoprotein E gene polymorphism and early onset of coronary heart disease. China Tropical Medicine 2008; 8: 41-42. Fan-Fan Z, Ming-Qiang F, Yin L, Wei-Jun L, Lin L. Researcn on the relationship between apolipoprotein E gene polymorphism and lipids in patients with coronary artery disease in Qinghai. J Hainan Med University 2012; 18: 64-65.